On February 1st 2012 Twentieth Century Fox UK will be releasing CHRONICLE, a movie about three ordinary teenagers who make an incredible discovery, leading to them develop extraordinary powers that allow them to do things they never imagined possible. As they learn to control their abilities and use them to their advantage, their lives start to spin out of control, and their darker sides begin to take over. As part of the build-up to the release the studio has launched a YouTube competition challenging the nation to show what they are capable of. YouTube users are encouraged to post a video response to the Chronicle UK YouTube channel, demonstrating their talents and skills to the world. This could be anything from making the best chocolate cookies to a 17,000ft skydive. The aim is to creatively explore the theme ‘what are you capable of?’ and give people the opportunity to showcase their skills and abilities. 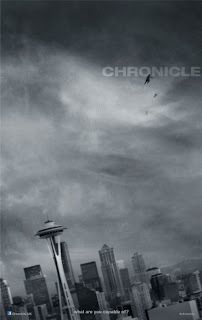 The best videos will be selected by Twentieth Century Fox to be showcased at a private screening before CHRONICLE is released in cinemas on February 1st. The selected videos will be put into a single clip demonstrating what the UK is capable of and also added to the Chronicle UK YouTube channel. To enter a video users will need to login into YouTube and submit a video response to the Chronicle UK YouTube channel that shows what they are capable of. Watch the instructional video here and join the Chronicle challenge. Alternatively users can also login into Twitter and tell @Chronicle_UK what they are capable of followed by hashtag #ChronicleUK. The competition closes Wednesday 25th January at 23.59pm GMT 2012. New technologies and social communities allow us to record, post and comment on every second of our lives, sharing our every emotion and opinion with the world, no matter how mundane. For three high school classmates who suddenly gain superpowers from a mysterious substance, the chronicle of their ordinary lives is about to take on extraordinary turn. Initially they use their powers to play innocent pranks on each other and people around them, but soon they gain confidence and learn to control their powers better to take on more difficult tasks. Their newfound sense of immortality and impunity will force them to evaluate their own morality to ultimately decide where to draw the line about how far they should go. The countdown to Sundance London begins NOW! Wishing you Arrrr Happy Chinese New Year! Do you want to be a Girl Model?